Your child will now be developing their confidence in working with and using numbers, including working out mathematical problems or calculations in their head. These ideas will help your child to build on their understanding of maths, and to see how their maths skills can be used in daily life. Can you tell what time of day it is? 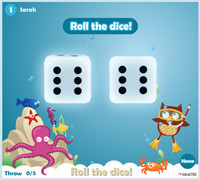 Play this dice game and practise addition skills. Most schools will start with the 2, 5 and 10 times tables and then move to more difficult ones. You can help your child by showing them real-life examples of a times table. For example, a muffin tin will normally have four rows of three muffin cups each, showing the multiplication 4 × 3. Find opportunities to sing and chant times tables together, for example, in the car or on the walk to school. Practise your multiplication skills with this fun game. how many pennies it will take to cover a book cover. Try these fun games with your child to practise maths skills and help to build your child's confidence. Most children love playing games and it's an easy way to support their learning. Roll the dice and practise your addition, subtraction and multiplication skills with this fun game. Visit our fun maths activities page for a selection of activities and resources designed to help you enjoy maths with your child.